In 2002, Mike Hout and I identified a new trend in Americans’ relationship with religion. Around 1990, the percentage of respondents to the General Social Survey (GSS) who, when asked their “religious preference,” picked the “no religion” option starting rising, doubling from about 7 percent, where it had been for many years, to 14 percent by 2000. That finding and our efforts to explain it stirred interest among scholars and leaders of American religion. A few weeks ago, the Pew Forum on Religion & Public Life convened a briefing session for journalists on what we know about these “nones” now, a decade after that report. Pew brought together researchers to discuss what the trends look like in three different national surveys – the GSS, the Gallup Poll, and the Pew survey itself. Although the methodologies of the three survey organizations differ (the GSS is the only one using in-home interviews) and the questions about religion that they use vary, there was nonetheless strong agreement on key points: By 2012, the percentage claiming no religion was between 18 and 20; the substantial increase in “nones” does not necessarily represent a decrease in Americans’ religiosity; and the trend in “nones” seems to be really about the act of declaring no religious preference. GSS interviewers ask, in person, “What is your religious preference? Is it Protestant, Catholic, Jewish, some other religion, or no religion?” In the 1970s and 1980s, the GSS estimate is that 7 percent chose “no religion”; in the 1990s, 10 percent did; in the 2000s, 15 percent did; and it reached 20 percent in 2012. Pew’s interviewers ask, over the phone, a yet more elaborate question, providing respondents with additional options, including “atheist,” “agnostic,” and “nothing in particular.” Adding the last three reply categories together, Pew estimates that 20 percent of respondents in 2012 declared themselves “unaffiliated,” up from 15 percent in 2007. By all these methods, the rise in “nones” is a major American social trend. The trend, however, seems not to be substantially connected with Americans’ religious faith and practice. We see this in two ways: one, by looking at who the “nones” are; two, by looking at other trends regarding religious expression. Who the “nones” are, religiously speaking: As Greg Smith of Pew stressed, most of the “nones” in their surveys are neither atheists nor agnostics; 71% of their “unaffiliated” pick “nothing in particular.” All three polls show that significant proportions of the “nones” say they believe in God and pray at least occasionally. Frank Newport, Editor-in-Chief at Gallup, emphasized their finding that the increase in “nones,” at least in the last few years, seems to have come overwhelmingly from the ranks of Americans who were not particularly religious to start with – people who did not consider religion important to them, who did not attend church often. The “nones” seem to be people who were already religiously marginal and now openly declare it. Trends in other indicators of religion: Newport showed that there was little change in religious practice or feelings in the last few years of the Gallup survey, even as the no-preference category grew. In the GSS’s longer time span, we do see changes, albeit much less dramatic ones than the rise in “nones” from 1991 to 2012. We see a drop from about 64 to 59 percent in the percentage of respondents who were certain without any doubt about the existence of God, accompanied by a rise from 6 to 9 percent in self-declared atheists and agnostics; a drop from 89 to 77 percent in the percent who say that the bible is either the literal word of God or inspired by God; essentially no change (80 to 81 percent) in those who say they believe in life after death; and a drop from 52 to 46 percent in those who say they attend church at least monthly. Notably, the percentage who explicitly say they “never” attend church rose from 12 to 25 percent in the same 21 years. If changes in religiosity – excepting perhaps the growth in those who say they never attend church – only weakly parallel the 13-point rise and the near-tripling of the percentage of “nones” since 1991, where do we look for an explanation for the increase in “no preference” answers? Again, the three research teams seem to agree that it is to be found in the symbolic nature of declaring oneself to have “no religion” or no religion “in particular.” Newport argued that something in our culture changed in the last couple of decades that now allow the sorts of Americans who were always pretty marginal to or uninterested in religion to feel free to announce to interviewers that they had “no religious preference.” Maybe such “self-labeling” is part of a general growth in the ethos of “be yourself” or reflects a widening distrust of large institutions. Michael Hout and I presented another angle on why more of the religiously marginal are declaring themselves to have no religious preference: they are making a declaration about cultural politics. Mike presented a graph similar to the one below. 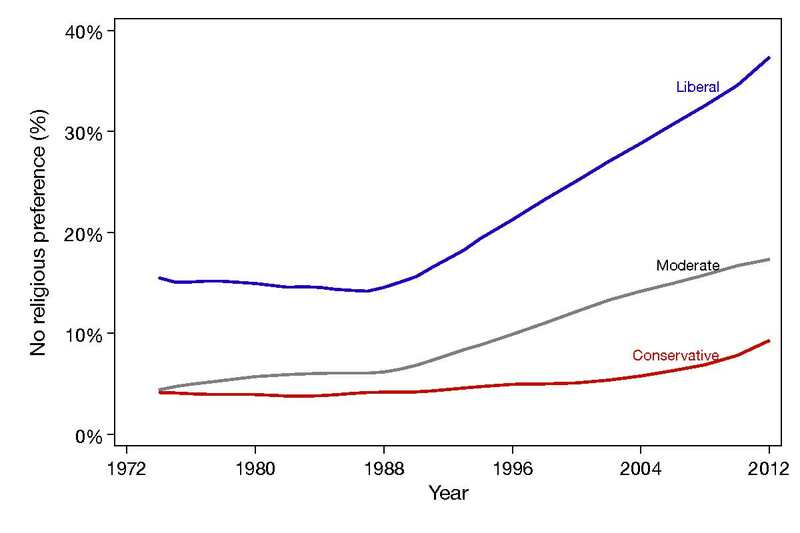 It shows that GSS respondents who described themselves as politically conservative (the red line) were only a bit more likely to declare themselves “nones” in recent years than in the prior roughly 35 years. But among those who described themselves as politically liberal (the blue line) the percentage who declared no religious preference soared from about 15 percent at the end of the 1980s to almost 40 percent now. The trend for self-declared moderates was in between. The growth of “nones” is largely the liberals’ trend. Our argument is that an important part of what has happened is this: A growing proportion of Americans, particularly young ones, who lean liberal (and were not much religious to start with) have responded to the growing connection between churches and conservative cultural politics by declaring to interviewers their opposition to organized religion. If religion means the “religious right,” they seem to be saying, then count me out. We made this argument in our 2002 paper and then, in American Grace, Robert Putnam and David Campbell elaborated it. Social scientists do not project trends forward, even ones that look like straight lines. In American history, there have been periods of strong religious enthusiasm (notably, the 1950s) and of “religious depression” (e.g., the 1920s; see here). For now, the “nones” seem to be more about cultural or political issues than about faith itself. Mike Hout was able, at the end of the Pew conference, to hold up Frank Newport’s recent book and read its title, God is Alive and Well, and then add, “But the churches are not!” That was a common theme of the conference presenters. 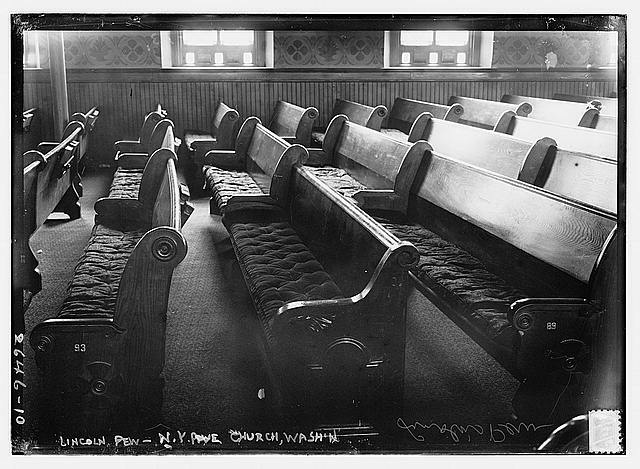 However, if increasingly more young Americans spurn the institution of the church – and synagogue and mosque – by declaring themselves “nones,” claiming to never attend, disdaining ministers, and then later by not baptizing their children, buying bibles, attending Easter services, adding to the collection plate, enrolling the kids in Sunday School, and so on, then sociologists would expect that private faith and practice would eventually lose the institutional structures undergirding them. Then, maybe, no “religious preference” would come to have a much broader meaning. The Golden Rule of religion is the most important moral imperative we must practice to enable the human race to survive. As long as peoples and nations fail to evolve socially by universally practicing the Golden Rule, our civilization shall most certainly fail to meet the increasing challenges of change due to overpopulation, declining resources, increasing poverty, climate changes, never-ending hatreds, wars and terrorism. Prof. Fischer, will we ever be able to evolve enough socially to save the human race from self-destruction?